This Premium Label Hobby Engine 1/25 University Club Yacht is a RTR or ready to run radio control yacht ideal for the beginner operating on 2.4 Ghz. The radio control unit is ready installed so it is ready to sail straight from the box. Great model with crystal remote control kit, so little if no interference from other standard 27MHz kit. Tends to lean sharply in anything more than a slight breeze (could do with a little more weight on the keel). 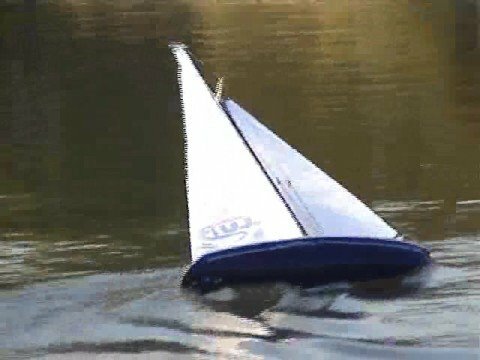 Ordered RC University Club yacht but out of stock. Purchased Noble Rc instead. Delivered very quickly and in time for sons Birthday. Easy to assemble. The sail trim did not work so Wonderland put me in contact with distributor to see if it could be fixed. Took a week to sort but they then sent a replacement. Original still here waiting collection. Got to sail this weekend in our pond. Wind was about 3 mph gusting 10. £ was fine but with gusts needed smaller sails. Made reef for main today so will be trying this later. Lot of fun to sail and can see it being well used. Buy good recharge batteries as they only last 1/2 hour. Best in a bigger pond like in a park. very responsive and control trim is very good.